To mark National Teen Road Safety Week State Representative Mike Marron today recognized the Danville High School Future Problem Solvers for their continued work to promote safe driving by young adults throughout our area. 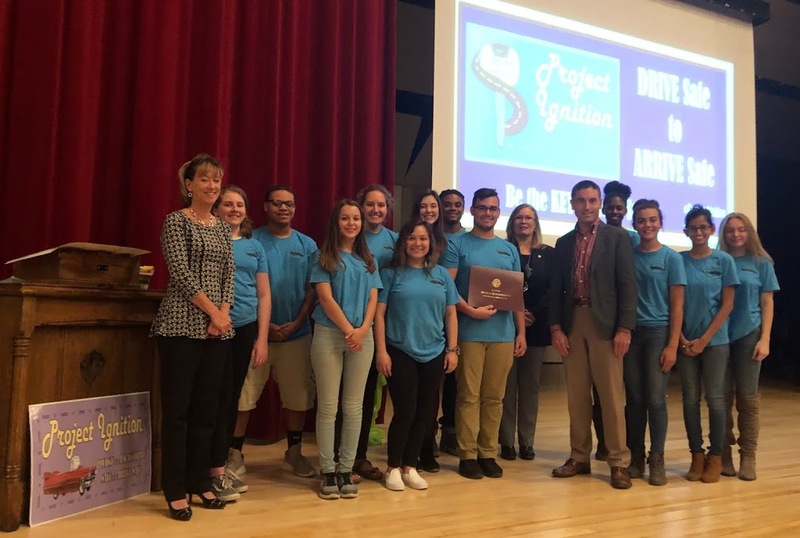 At a special ceremony at Danville High School, Representative Marron presented the group and their sponsor with a special House of Representatives Certificate of Recognition along with his thanks and praise. Last year, the Danville High School Future Problem Solvers Project Ignition won state and national acclaim. This school year’s continuation of the award-winning program in effect during National Teen Road Safety Week includes working with local businesses to post road safety messages throughout the community; especially in areas where more accidents traditionally occur. The Future problem solvers are continuing their successful “Traffic Tip Tuesday” and Facebook safety campaigns; and are also taking their message on the road to area elementary schools in the weeks before Halloween. “Halloween can be the most dangerous night of the year for young drivers and for children crossing the streets to Trick or Treat. Everyone needs to be mindful about their safety, and the safety of others too,” Representative Marron said.